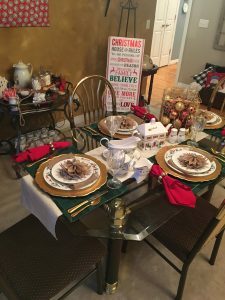 Hello again friends and welcome back to our very Merry Christmas home tour. If you are following along on our blog hop, welcome. If you are just joining me, I have teamed up with a fun group of ladies who take you on a tour of our homes. The blog hop tour group is linked at the bottom of this post. 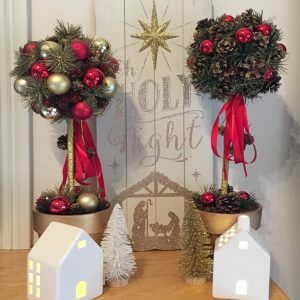 Today, I want to take a less tradition look at a Christmas home tour and instead of focusing on an entire room or rooms I want to show you several tiny places where you can easily add some holiday cheer to your home. This entry way table and built in corner shelves greet our guests as they enter our home, so they are the perfect place to begin our Christmas tour. 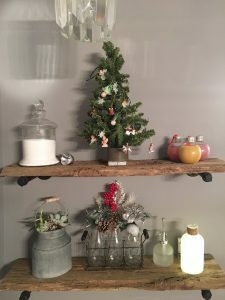 Each of these small spaces are the perfect spot to display Christmas collections. 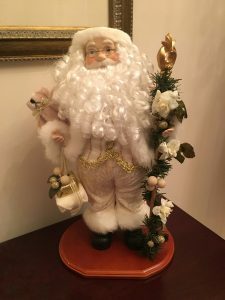 This Santa, “Rich Santa” as my Dad called him, has been a part of my Christmas decor for years. 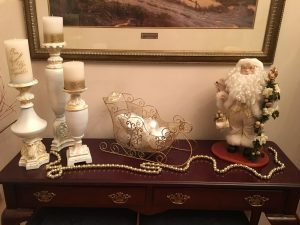 He isn’t always in the same spot, but this year he looks wonderful on the console table. 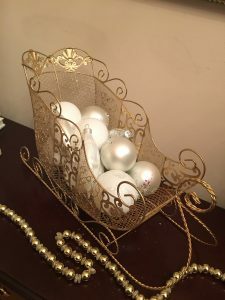 I have always thought this sleigh looks so luxurious. It’s been used in various spots in our home over the years. Last year we used it as a centerpiece for our craft table at the kids’ Christmas party we host for our kids and their friends each year. 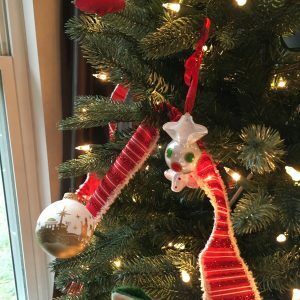 If you would like to see that craft DIY and a peek at how we used the sleigh last year, please click here. One final addition to the console table this year is these white and gold candlesticks and candles. 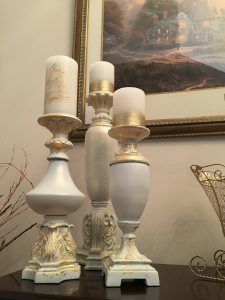 I painted and gold leafed these candlesticks, the tutorial and a before picture can be found here. 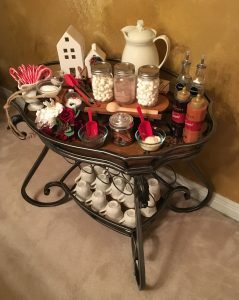 For fun each Christmas I like to set up a hot cocoa bar. We have a beautiful wine rack that I convert and it’s such an unexpected fun spot in the dining room. Between the entry and the dining room sit these built-in corner shelves. They are one of my favorite spots in our home. I love to decorate them with vintage, meaningful pieces. For Christmas, I simply swap out some of the accessories and add in some Christmas colors. The flowers are pre-made bouquets from Michaels. 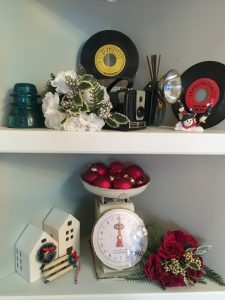 I removed the farmhouse beads and added a sparkly beaded garland, and added some red glass ornaments to the tray of the vintage scale. The tiny white houses were made ready for Christmas by adding a wreath (which is held in place with a piece of scotch tape) and a sled was placed out front. Near the antique camera my son added a whimsical snowman figure. The blue and white church sitting below the shelves is an advent calendar my kids have used every Christmas to count down the days until Christmas. Nothing says Christmas like a fireplace. However, since our TV sits on our mantel I can’t completely deck the halls there without interfering with the remote, and while I don’t watch TV very often, when I do watch I want to do so from the comfort of my chaise. So having the remote work is a big deal for me. Since I can’t drape a garland across the mantel, I decorate each side of the mantel. I mainly decorated with red, green, and white this year, but on the mantel I also added some touches of gold. 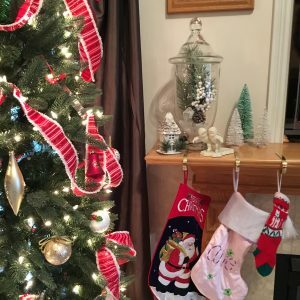 Stepping away from the family room, there are lots of easy ways to add Christmas touches to your kitchen without taking over the entire area. I love to bake, so one unique item I keep in my kitchen is this spice rack. It came pre-filled with spices, so I purchased new bottles and I keep them filled with seasonal sprinkles. Sprinkles are way more fun to look at than spices – plus spices last longer if they are stored away from light. 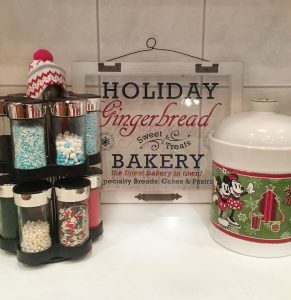 For the Christmas season I added this cute little knitted cap to my spice rack just for fun. 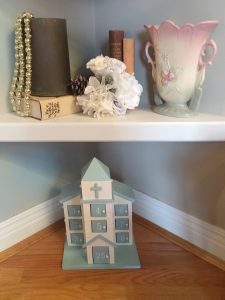 This cute little vignette could go anywhere, but it’s currently sitting as the centerpiece of our breakfast table. The moose is a Christmas countdown. I just love how he looks surrounded by these cute little white houses and bottle brush trees. 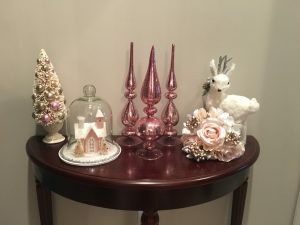 This vignette was very inexpensive to put together. 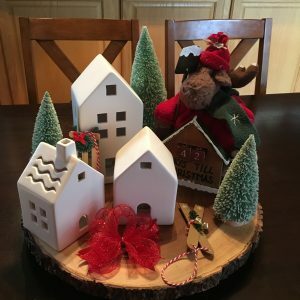 We have had the moose and the lazy susan on which it all sits for years, and the remainder of the items were purchased from the Target Dollar Spot. In fact, the little houses have been making their way around my decor for months now. One final spot in my great room area is this little display near the breakfast table. This tiny wall is difficult to photograph, but thanks to these bins, so easy to decorate. For Christmas the top bin contains floral picks. The middle bin has pre-made bouquets and the bottom bin combines a couple of poinsettia flowers with some sparkling ice skate floral picks. 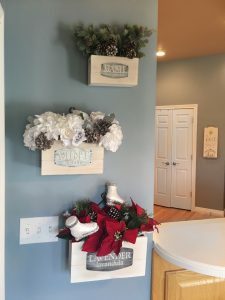 The bin are from Hobby Lobby, and all of the current seasons decorations are from Michaels. Finally, let’s take a peek at some tiny spots in the master bed and bath that are ready for Christmas. I recently made these gorgeous shelves from some up cycled wood my Mom gave me. You can check out how I made these amazing shelves here. For Christmas, I simply switched out some of the decor. This tiny little table is the perfect spot for a little Christmas cheer. I used blush, gold, and white here. This area of our home is separated from most of the other areas so I feel like I can go for a completely different color here without interrupting the overall flow of decor. Thanks for visiting, we hope you enjoyed your stay as much as we enjoyed having you here. 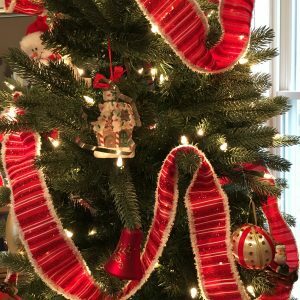 For more great Christmas decorating inspiration please follow along with these other lovely accounts. Yes!! I love all the cute vignettes & the tips! Wonderful job. Thank you Latoya! Glad you liked them. 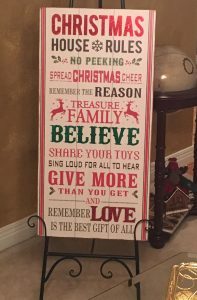 I love that Christmas rules farmhouse sign!